But it’s really got me wanting to reach this level that this artist is at. The hardest part for me are the eyebrows and lower lashes so I’ve really been trying to learn how these artists get that soft sweeping look. They use different techniques so there isn’t really one way to do it. Here below I tried the pastel shadow and then painted the hairs. I’m anxious to buy more resin heads and work away at them but that’s not practical just yet. It could get pretty expensive unless I’m sure I’ll be able to sell them. But it is so much fun and gratifying to learn this art and hopefully I can expand on it and get more creative with it. The resins are truly taking over. 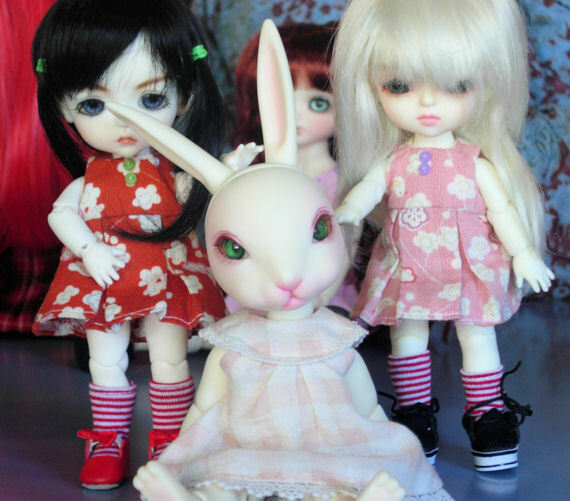 Here pictured with my 2 Latis is a MSD sized little girl from Luts. She’s a Kid Delf Bory. I’ve named her Kino after the anime Kino’s Journey. I did the face-up on her and again fussed over the eyebrows quite a bit. I’m finally going to leave them alone and she’s really a cutie. She’s the big sister to the tinies. So in my title I mention about poor customer service. I had a pretty lousy transaction with an online seller who shall remain nameless. But I will be happy to divulge this information to anyone that asks privately. I decided to track down some Olsen twin dolls hoping to find a body similar to Blythe that could take the special spray paint I got to make a black Blythe. I avoided eBay and went with some unknown through another site that had a collection of online antique stores. The dolls were $6.00 and domestic shipping was $9.00 . Yes that’s right- 2 dolls that come to about 9 oz and they were charging more than the dolls themselves and more than double the actual cost to ship the dolls. What’s more, they didn’t ship it priority mail which would have cost them about $5.00. They state on their site they ship insured parcel post. Well, I finally found out they didn’t ship it insured either. If they shipped it first class package rate it would have cost them $2.70. I’m guessing they shipped it for $2.70. So here’s the lesson for the rest of us sellers that strive to give excellent customer service. Don’t try to pad your shipping cost so much just because your other fees are cutting into your profit margins. If you’re going to add handling fees then you sure as heck better make sure the customer gets their package and send it with a tracking number so if it does get lost, you can show the customer you sent it and you’re not some fly by night scammer. I’m not going to wait around guessing whether it was really sent or not. I don’t have a crystal ball and I don’t expect my customers to have a crystal ball either and just take my word for it. If a customer asks questions no matter how stupid and how much you think it is a waste of your time, answer them! And answer them professionally. This seller didn’t act professional in the least. I asked for tracking numbers, I expect a response one way or the other. I didn’t find out there was never a tracking number until after I filed the claim with paypal. That’s a little too late to respond to my questions don’t you think? Naturally this seller thinks I’m one of those difficult avoid at all costs customers and she made no bones in letting me know that. Again, I had to laugh. I’ve done so many online transactions and have met so many wonderful people both sellers and buyers from all over the world. This is the first deal that went sour. I can say one thing for certain. She doesn’t have to worry about ever getting business from me again. If this seller continues to run business this way I won’t be the only problem customer she’ll ever run across and want to avoid. And that’s all from the trenches of dolly land. I know all of us doll collectors-especially of the Asian doll variety are quite versed in internet shopping and weighing costs of shipping, exchange fees, reliability of overseas sellers ect… Here’s to more savvy shopping and may you never run accross problem sellers with poor business practices and very poor customer service! I have so much catching up to do and so much is going on. 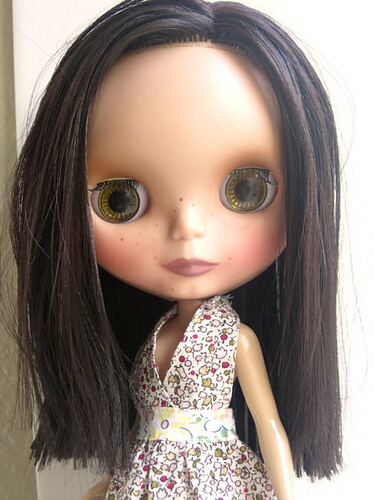 Here is my latest commission for a customer who wanted a “mini me” She’s a latina Blythe and was previously a Cinnamon Girl. 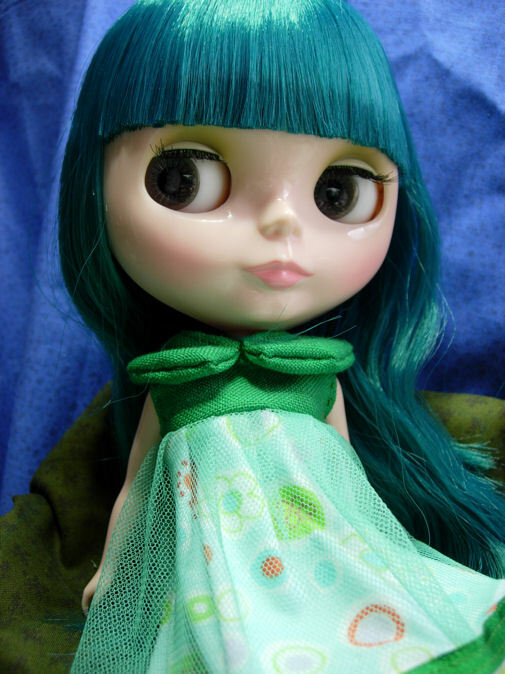 I re-rooted her and gave her make-up and eye chips. I really love how this one came out and find my airbrushing is getting better over time. Still got a ways to go before I get more fancy but hopefully not much further. Last weekend, I went to my first ABJD meet. 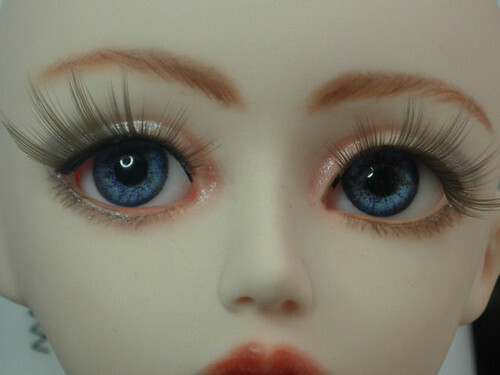 It was really neat seeing the other dolls and to get closeups of dolls that I was curious about. I really loved the Luts Delf and Kid Delf that attended. I brought my Puki PIpi and many had been curious to see one up close. The Puki’s are pretty popular tinies nowadays. My Twee Twee Spurred some Puki shopping sprees among some collectors. 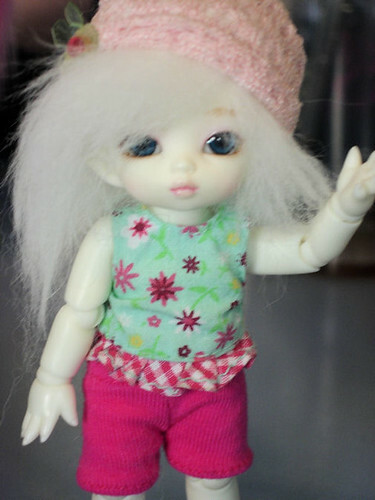 Here’s Twee Twee in a wig I made her. This is my first one and I’ve get to make some more to get the hang of it. It was hard finding the right size for her so I put one together. So it’s official. I’m now a resin addict and plan to attend more meets in the future. I have closed my commission book for a bit so I can get ready for IFDC at the end of July. 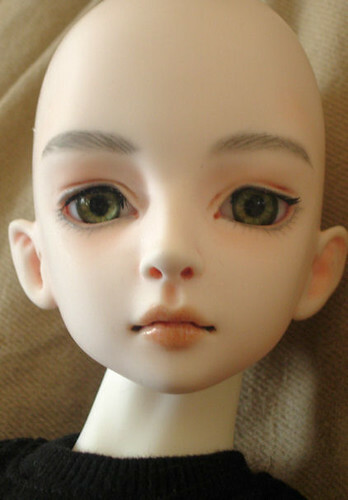 I took a break in between commissions here and did this Volks Dollfie man head. Then I gave him a razor cut and I think my Momokos are going to fight over him. 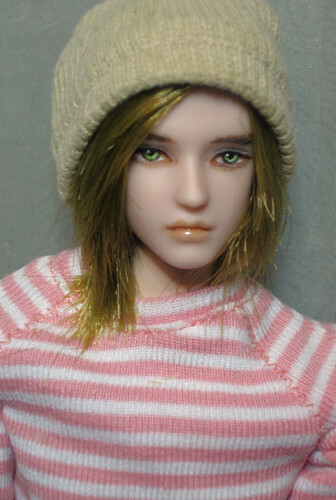 I’m planning on bringing him IFDC and have some other doll heads to work on so I can offer them up for sale. 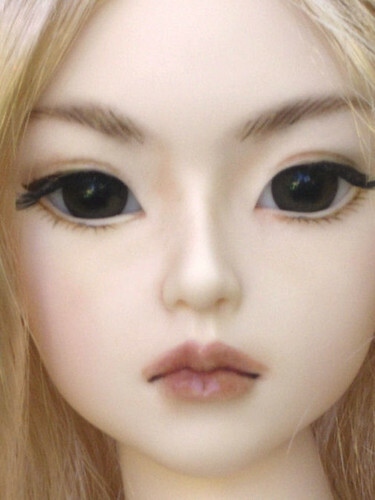 So, as I said in my title “famous last words” because in my last post I said I wasn’t into the bigger ball-jointed dolls and then after finishing my face-up on Sooah, I felt like playing with her. I put a black wig on her and she turned completely asian and really cool looking so I going to style her up in more street clothes with a punk goth type theme and will also bring her to the convention. I may even try to make clothes but I’m still a beginner in sewing and have lots to learn. 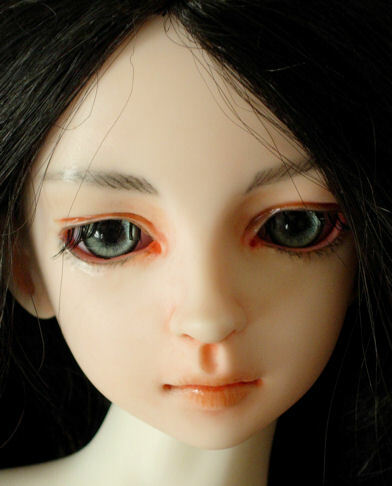 I guess working on Sooah and getting her face-up just right brought out her personality and I guess we “bonded” as they say in the doll world. Again, sitting in the not played with pile so I will also adopt him/her out. I just prefer little dolls and when they get bigger than 11 inches tall, I lose interest. I don’t have the room for dolls this size with little hands wanting to grab and tug so it’s just not practical. They are lovely to look at in pictures so I’ll just enjoy them from that angle. Working on these dolls was a nice change of pace from re-rooting. I have stuff waiting to be done and will tackle those this weekend. But I have to break it up so as not to get burnt out. Here’s my latest re-root. Just a simple one but less is more sometimes. I also changed her eye color, eyebrow color, added lashes and freckles. So I just realized I think I’ve had this blog up for a year now. I can’t believe how time flies. I was reminded of this because of a comment on one of my very first 60cm face-ups. Admittingly not my best work but hey, it was my first one. So here’s my latest one. I had his picture up a few days ago but ended up redoing him and like him better now. Not so washed out looking and very sweet and innocent. I re-worked this wig too so that it would be more boyish. Gave it a haircut and turned it on it’s side. I may still get another wig for him as this one is kind of funky. So today was quite a happy doll day. I finally got Princess a’ La mode after a few months of buying her. She was waiting on the release of Momoko Slow Smile Traditional. That release was delayed quite a bit so PAM now named Midori was waiting in Japan for a while. I guess you can say it was an early Christmas for me. Such colorful girls. Who knew I’d be drawn to fantasy hair color. I’ve had this head for a while. It’s a DIM Persia head. I was going to give him a face-up and then sell him but decided to keep him. 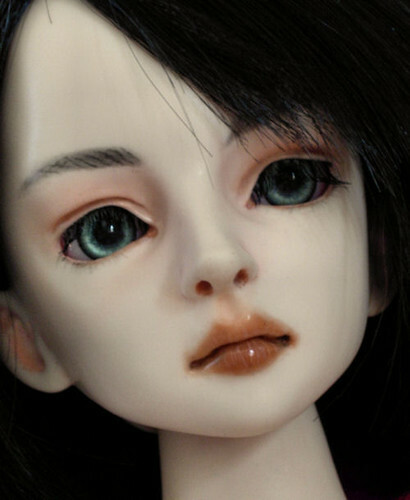 And while I liked this face-up o.k., I started getting nit picky and next thing I know, I almost started over again. I’ll take pics of that tomorrow. He’s waiting on an outfit from Volk’s because he’s got nothing to wear. I got him a track suit because that’s all I can afford at the moment. Man, the clothes for these type of dolls get expensive!!! But they’re very cool. I’ll definitely go for the more rocker punk look I think. We’ll see what strikes me. 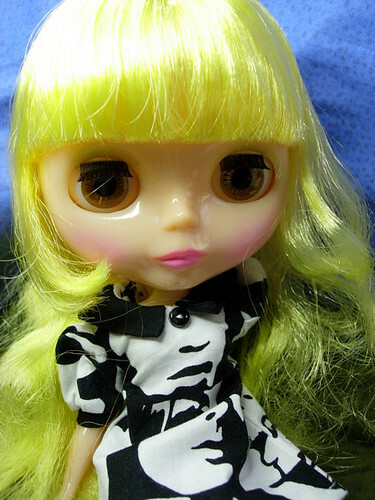 In the Blythe world, I got Retro Mama. I just couldn’t take it anymore and had to get her. I sold some things to pay for her and I’m not sorry I had to let some other dolls go. She is so cool. She has this luminescent skin. Very cool. I’m also waiting on Princess Al a Mode. I actually got her in late October but was waiting on Slow Smile Momoko’s release and expect them in one big package from Crescent. Ichigo Heaven is in there as well so it’ll be quite a dolly bonanza. And that’s it for dolls purchases this year. Honest, I swear… Oh wait, I pre-ordered Follow My Back Momoko. But that’s really it. Anyway, here’s a picture of Meringue, my Mrs. Retro Mama aka MRM.